Molesey Conservative Residents: Heathrow to bring an early end to its airspace trials over Molesey! Heathrow to bring an early end to its airspace trials over Molesey! Fantastic news! Heathrow Airport has announced that it is ending its airspace trials over Molesey on November 12th, rather than in late January! This is great news for all of those residents who have been enduring noise nuisance from an increase in the number of overhead flights whenever an easterly wind is prevailing. 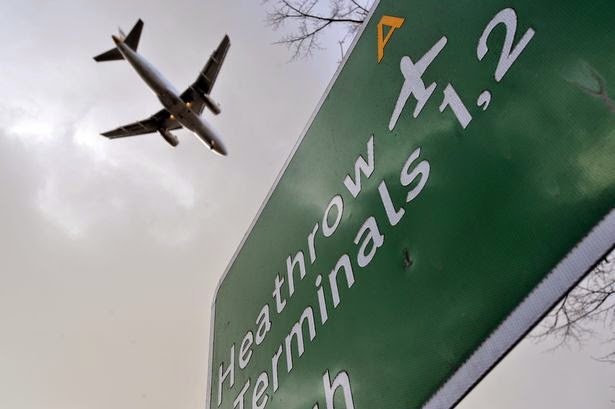 Councillor Steve Bax and the Molesey Conservatives have been leafleting residents to encourage them to write to Heathrow's complaints email, so that local views are taken into account by the airport in any proposals for permanent new flight paths. From 2020 aircraft will switch from ground beacon-based navigation to satellite technology, resulting in narrower, more concentrated flight paths. MP Dominic Raab's public meeting at St Mary's Church Hall in East Molesey on September 24th was packed with around 120 people. Dominic said this week: "I am very relieved local residents will be able to enjoy Christmas without the disproportionate noise from these trials. Councillor Steve Bax and I worked hard to get Heathrow to act on local concerns, and it’s good news that the authorities are listening. Now, we need to work together to make sure we don’t see any return to those kinds of noise levels in the future." A change.org petition to stop the trials and not make the changes permanent has been well supported by residents of Teddington, which is under the same flight path, and Molesey. Heathrow Airport today announced that it will be ending the current airspace trials on 12th November, instead of its original scheduled end date of January 26th 2015. Heathrow will also be postponing trials scheduled to commence later this month. These trials being run in conjunction with NATS, are being driven by Government’s Future Airspace Strategy, which requires that all airports implement changes to modernise airspace by 2020. Heathrow’s current easterly and westerly trials affect departing aircraft, and began on July 26th and August 25th respectively. The trials have been testing concepts and techniques necessary to inform how airspace can be better managed in the future. The routes are not indicative of future flight paths. To date, the trials have been successful in collecting large amounts of data and have provided valuable insight into the design and feasibility of operating precision routes and how Heathrow could maximise noise respite for local residents with new airspace design. In light of residents’ feedback and after meetings with local authorities and Members of Parliament, Heathrow asked NATS to consider shortening the trials. It is the view of NATS and Heathrow that sufficient data will have been collected by 12 November to confirm the findings of these trial. Given that is the case, the trials will stop on that date. Heathrow, like other airports throughout the country, is still required to provide the necessary data to inform the Civil Aviation Authority’s plans for future airspace modernisation and will be required to run other trials in the future. The reaction to the current trials has been much stronger than previous trials held earlier this year. Heathrow will therefore review how any trials are carried out in future and will ensure the details of future trials are fully publicised to residents in advance. Any permanent changes to airspace require Government approval and will be subject to full public consultation.